Kumbel Pass access road excavation at the Tulkubash project. Photo by Chaarat. Kyrgyz gold producer Chaarat (AIM:CGH) and Turkish mining and mine construction contractor Çiftay İnsaat Tahhüt ve Ticaret signed today a binding term sheet to enter into a joint venture with the idea of collaborating on the Tulkubash and Kyzyltash projects in the Kyrgyz Republic. 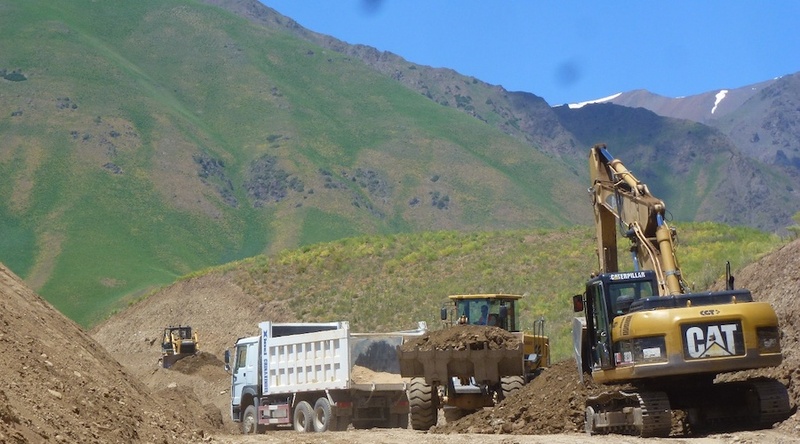 In a press release, the companies explained that even though they have worked together since 2017 and that in 2018 Çiftay mobilised equipment to the Tulkubash site in the western Chatkal Valley, the Turkish firm will now be appointed as construction and long-term mining contractor for the gold project. In addition to the prior, the deal stipulates that Çiftay will progressively invest $31.5 million for a 12.5% equity stake in Tulkubash and Kyzyltash, which have been valued in $252 million. Definitive agreements for the joint venture are expected to be concluded in Q2 2019. Exploration at the Tulkubash project has defined 1,657,000 ounces of gold through approximately 78,000 metres of drilling. According to Chaarat, Çiftay’s investment provides a significant amount of the required equity for the Tulkubash project. Total capital expenditure for the project is between $120 and $130 million, and after Çiftay financial input, the vast majority of the remaining capital expenditure is expected to be debt funded. “Çiftay’s investment represents a significant milestone for the funding of Tulkubash and clearly demonstrates the company’s inherent value,” Martin Andersson, Executive Chairman of Chaarat, said in the media brief. Andersson explained that construction is ongoing at Tulkubash, that the first gold production at the open pit, heap leach operation is expected for 2021 and that the recent resource update continues to suggest the emergence of a significant new gold district. He also said that Çiftay has earthworks equipment at the mine site and built a temporary construction camp this winter to be ready for an early spring start to major earthworks. Corporate information states that exploration at the site up to January 2019 has defined 1,657,000 ounces of gold through approximately 78,000 metres of drilling. This is contained within 3.2 kilometres of strike in the southern portion of the 6 kilometres long mining licence. The Kyzyltash project, which is also part of the JV with Çiftay, comprises a sulphide ore body and represents a long-term development. Chaarat reports that over 80,000 metres of drilling has been carried out to date, which has defined a large high-grade resource of 5,377koz: 46.1Mt at 3.75g/t.